Studded tube is also known as the head tube screw ribbed tube. 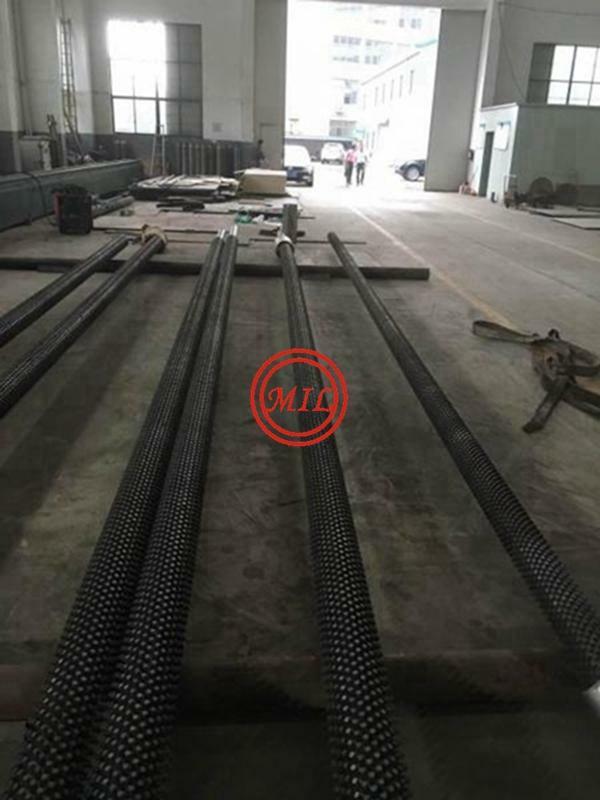 Studded tube is more widely used in the petrochemical industry. 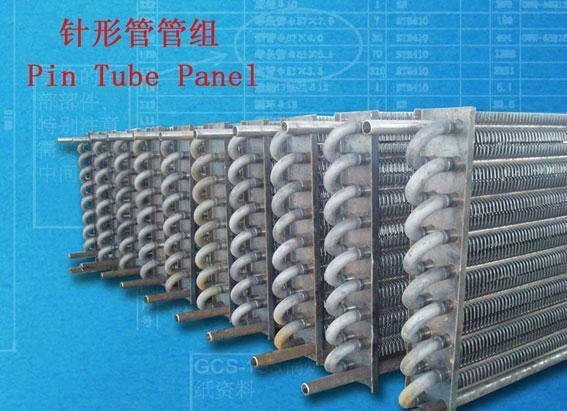 Especially, in order to strengthen the heat transfer effect in the outside of the tube, Studded tube is also used in heat transfer components in a tube furnace convection chamber. 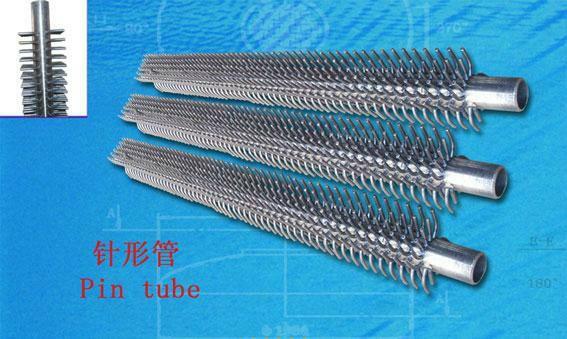 Studded tube can improve the heat transfer coefficient of flue gas side. The surface of studded tube is 2 ~ 3 times of the light pipe, so the application of studded tube can obtains the same intensity with heat radiation under the reasonable condition. 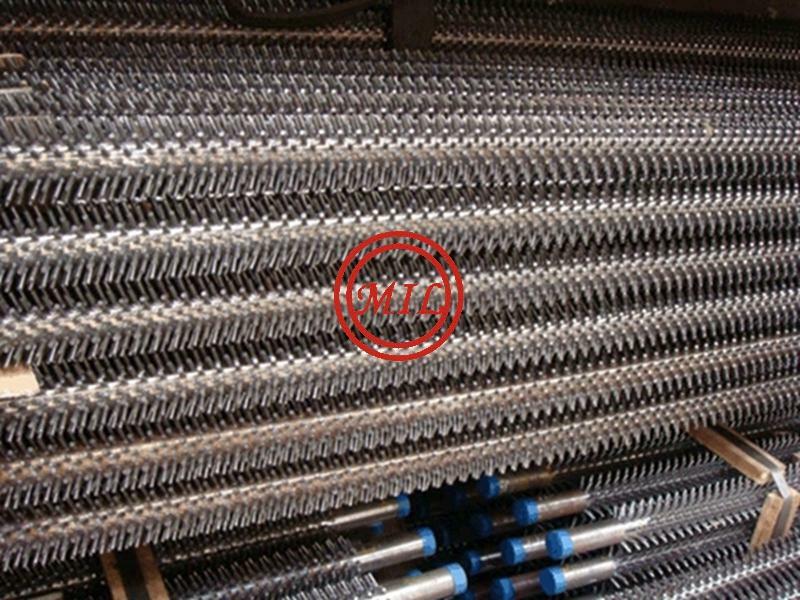 The company nail head tube equipment adopts resistance welding welding method, welding process is controlled by PLC program, and dividing the feed motor servo motor, nail man-machine interface to set quotas, dividing parameters and compensation coefficient, according to the technological requirements set to ensure product quality and precision. Because of their relative ease of cleaning,Studded Tubes are used in furnaces and fired heaters as an alternative to high frequency welded finned tubes wherever the process application is such that heavy fouling of the surface may occur. The studs are attached to the pipe in diametrically opposing pairs around the circumference by electrical resistance welding to ensure a high integrity bond for strength and heat flow. Stud diameter, height and pitch can be specified on an individual basis. Welding tests are carried out as a matter of course to ensure the effectiveness of the stud to pipe bond. Heat treatment of the completed studded tube is carried out where necessary. Should fouling eventually reduce the process performance of the equipment,the studded surface can be cleaned efficiently by shot blasting without damage to the materials. Studded Tubes are applied to convection chamber of heating furnace in petrochemical industry to increase the heat transfer coefficient at the fuming side. Studded Tubes are two or three times the square of light Tubes,the hot strength can be obtained as the same as radiation in the reasonable design. Studded Tubes manufactured by our company adopt resistance welding method. Welding process is controlled by PLC program. Feeding motor and graduation use servo motor. Studded number can be set via the human-computer interface. 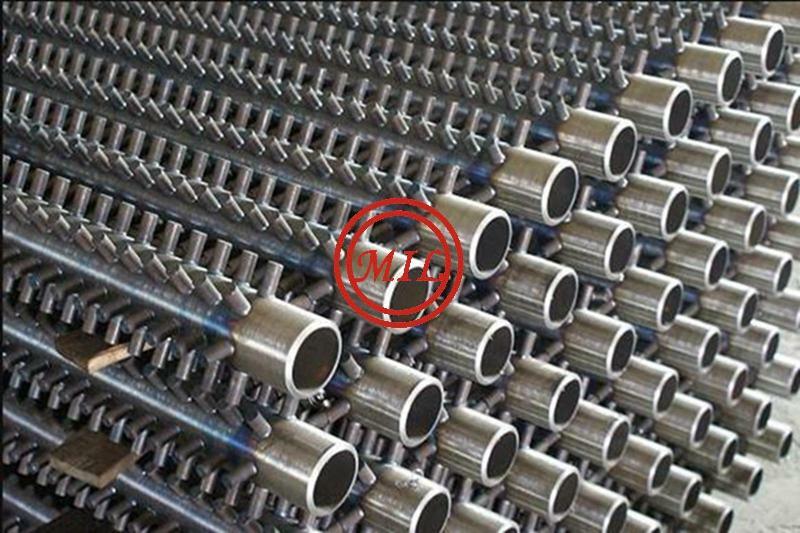 Steel studded tubes are used instead of finned tubes for heat transfer in the processing industries, generally in furnaces, gas turbines, fired heaters and furnace applictions where the surface is exposed to a very corrosive environment and where very dirty gas streams require frequent or aggressive cleaning. The steel studs are automatically resistance welded to the tube, producing high quality forge welds. The welding process enables the combination of any grades for studs and tube: carbon, low alloy, stainless steels and high nickel alloys. Alloy steel pipes are stress-relieved after studding, according to the relevant specifications for the class and grade of steel used. 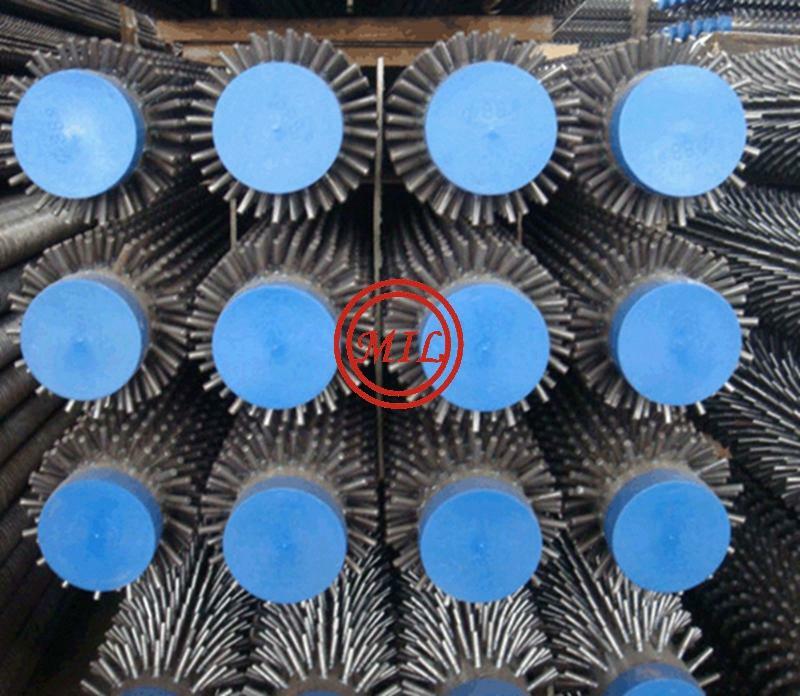 Because of their relative easy of cleaning, studded tubes or nail head pipes are used in furnaces and fired heaters as an alternative to high frequency welded finned tubes wherever the process application is such that heavy fouling of the external surface may occur. The studs are attached to the pipe in diametrically opposing pairs around the circumference by electrical resistance welding to ensure a high integrity bond for strength and heat flow. Stud diameter, height and pitch can be specified on an individual basis. Welding tests are carried out as a matter of course to ensure the effectiveness of the stud to pipe bond. Heat treatment of the completed studded tube is carried out where necessary. Should fouling eventually reduce the process performance of the equipment, the studded surface can be cleaned efficiently by shot blasting without damage to the materials. An electric current is applied by connect on the stud and tube and theresistance in this circuit produces the heat necessary for welding. Maximum resistance and therefore maximum heating occurs at the interface between the Stud and the tube. Pressure to forge the Stud and the tube together at the point of maximum heating is applied by various forms of tooling. These resistance welding processes produce a strong metallurgical bond between the stud and the tube while minimizing the heat affected zone (HAZ) in the tube. The use of pressure to forge the fin and the tube together helps to minimize the heat input necessary to make the weld. This Product is used in Fired Heaters under Very High Pressure & Temperature mainly in Petroleum refineries. Studding of pipes up to 8 inch dia and stud diameter up to 18mm can be supplied in Carbon steel, alloy steel and stainless steel pipes. 1)Satisfying connection surface, little heat loss . 2)Welding connection rate higher than 90 percent. 3)No need of welding power, hardly any welding tumor . 4)Narrow heated zone on the surface, no melted pool, without destroying the tissue of basic tube. Base tube : Diameter, thickness, length and material specification and whether ends are plain or weld prepped.